You can arrive earlier, say about 6pm or so, to avoid the wait. The establishment can seat quite a large crowd but the tables are not designed for large groups of 10 or so, thus you may need to combine tables if you come in a large group. There were only four of us but we found it difficult placing all the dishes within the space of the standard-sized table. Bear in mind that during the day, this IS a coffee shop after all with stalls selling curry noodles (which is quite famous, the Ma Jie brand) and so forth. 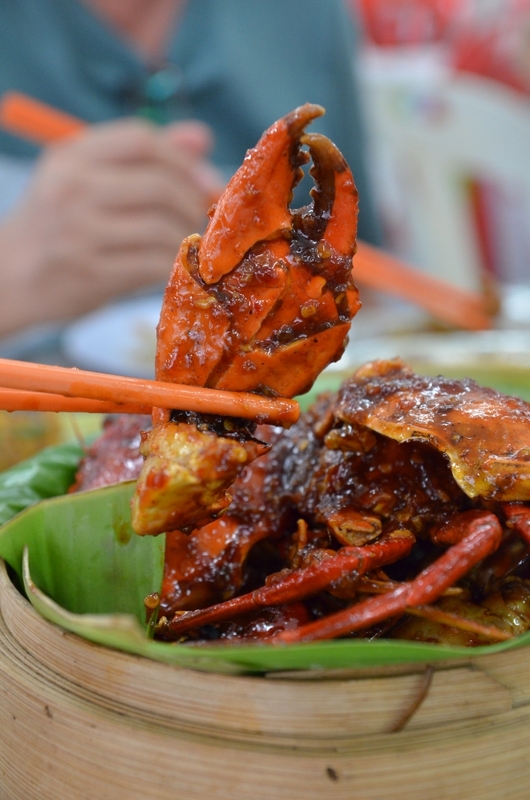 One of the must-order dishes here is definitely the crabs. You can ask for their freshest catch of the day; ranging from crabs to prawns, fishes to sea shells. Then ask them to suggest the best way to serve them as this is a typical street food stall with no menu so don’t expect one for your browsing pleasure. We usually settle for the black pepper or sweet and sour crabs here but this time around, the lady who took our orders recommended the siu long hai; literally translated to small basket crabs or little dragon crabs depending on how you decipher the phonetics.The former translation is probably more accurate, as the crabs were baked in a medley of savoury, spicy and slightly sweet sauce; placed on top of banana leaves lining a round basket not unlike the ones used for dim sum. The sauce was finger-licking delicious; and you can throw all manners out the window by picking up the steel claw cracker and hacking away (if necessary, or you can use your teeth, but the shells are usually cracked prior to serving). You would probably be tempted to lick the shells clean inside out, and I don’t blame you. 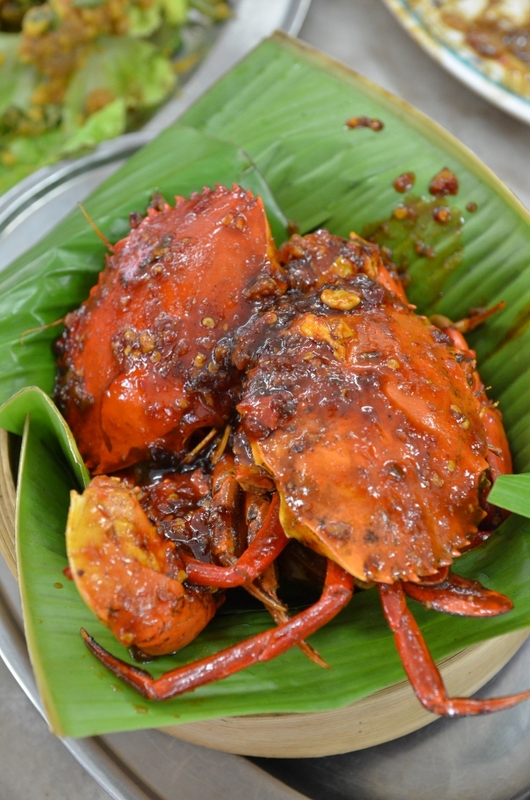 This variety of crab gravy is absolutely spot on; the complex flavours intertwined beautifully, complementing the supple, sweet flesh of the mud crabs within. Not a fan of crabs? No sweat. Ask for what’s fresh in terms of shellfish — the bamboo clams, lala clams or even cockles are staples and readily available. 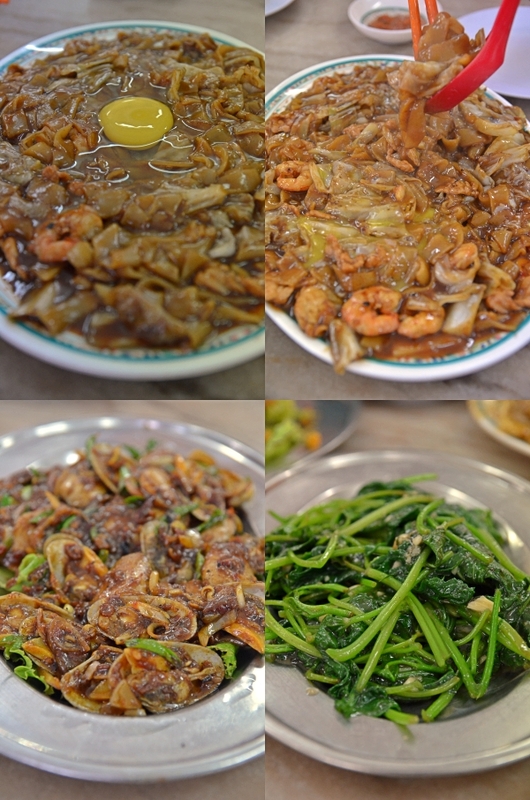 We enjoyed the lala clams cooked kam heong style complete with briny bits of dried shrimps and curry leaves. The freshness was evident and entirely compulsory in my books; as anything less than stellar may result in a disastrous platter of stale lala. 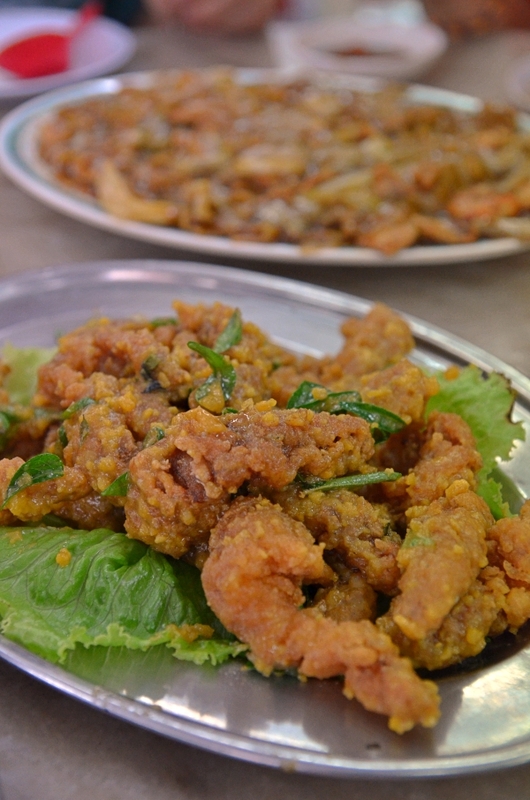 Try also the salted egg mantis prawns; a dish best described as dry, crunchy, salty and a perfect foil to a pint of chilled beer. But even without the accompaniment of alcohol, this is a clear winner in our opinion and should be a favourite with the kids as well. 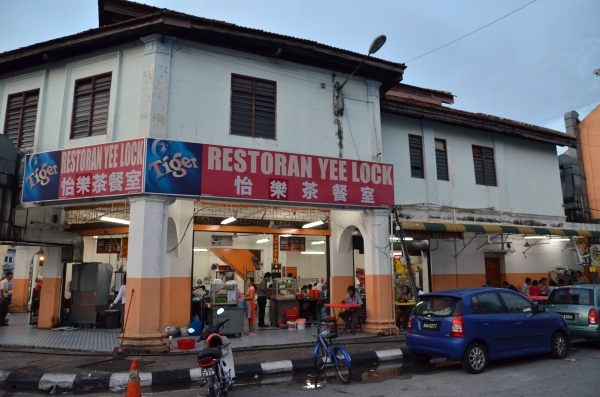 We never bothered to ask for steamed rice, and I doubt they serve that with the seafood dishes, but you should definitely opt for one of their signature noodles; the moonlight kuey teow. Now this is not a very common item especially outside of Ipoh, but the magic in this slightly wet fried kuey teow (flat rice noodles) dish is the cracked raw egg on top of the piping hot noodles; waiting to be stirred in to create ribbons of golden, runny goodness. Packed with slices of lean pork, shrimps and cabbage, this is a complete dish on its own, and not out of place when paired with the other dishes here at Yee Lock. While waiting for the mains, you can also order a roll or two of the famous popiah; operated by the son of the incredibly iconic (if you are an Ipohan, then you will concur) Canning Garden popiah uncle who has since retired from selling in the back alley, due to health reasons. The seafood stall is open for dinner only. *Motormouth is still recovering from a week long travel to Taiwan, Singapore, Philippines and now actually recuperating in Malaysia. Pardon the long break in between posts; the upcoming transfer post-Singapore (let me reveal the location in the next post) is already on the horizon, threatening the very foundation and is making me worried of the sustainability of this website. May I ask about the pricing of the dishes mentioned above? Thanks. wow food are really awesome. I have tried it last week. Oh ya price of the food was reasonable as well. I am planning to come back soon. Awesome written article with all the details and pictures are also good.